Shown on the right is a theme based on the very nice bezel created by the artist “Ambermoon” (you can download this theme here). Starting with version 1.3.8, FS-UAE supports loading custom themes. This page describes the options available for making custom themes. If you create a nice theme, consider making it available for download and post a link in the comment section to share it with others! Since 1.3.8. Use this option to use a specific theme. The theme folder can be located either in share/fs-uae (a bundled theme), or in (My) Documents/FS-UAE/Themes. Colors are specified like this: #rrggbbaa where each color component is a number from 0 to 255 (hex). You can omit alpha value, in which case the alpha is implicitly set to 255 (ff). Since 1.3.8. The color the screen fades out to when exiting FS-UAE. Since 1.3.8. The top color of the wall gradient. Since 1.3.8. The bottom color of the wall gradient. Since 1.3.8. The top color of the floor gradient. Since 1.3.8. The bottom color of the floor gradient. Most of the look of the sidebar comes from textures (see the contents share/fs-uae), and can be altered by overriding these images in the theme. Since 1.3.8. The color of the heading items in the sidebar. Since 1.3.8. This option allows you to specify the name of a png file which will be stretched (if necessary) and displayed on top of the screen. 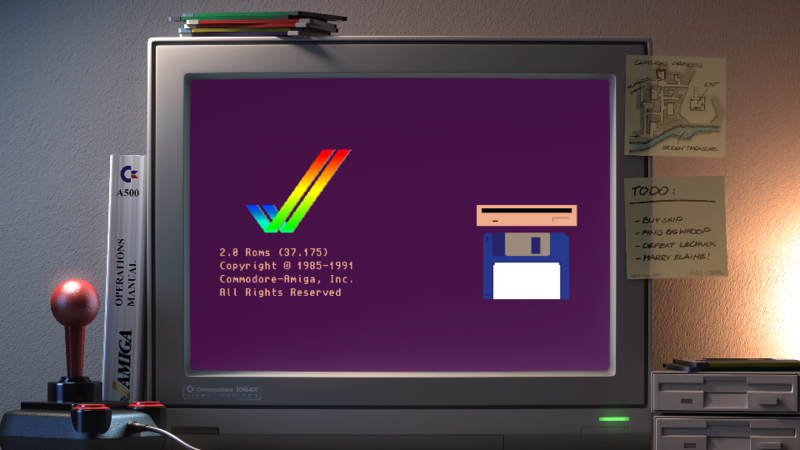 The image should have transparent areas (alpha channel), so the Amiga display will show through. You will also normally want to set scaling options (or other display options) to make the Amiga display output fit the overlay image. custom_0 – will be displayed when df0 LED is active. custom_1 – will be displayed when df1 LED is active. custom_2 – will be displayed when df2 LED is active. custom_3 – will be displayed when df3 LED is active. The images themselves should be named custom0.png, custom1.png, etc. and put in the themes folder. You only have to provide images for the effects you want to show. The images can have any dimensions. And similarly for the other custom images. Important note: the coordinates are relative to a 1920×1080 coordinate system with (0,0) in the top-left corner, even though your window may have another size. This means that the center of the window is always coordinate (640, 540). Since 1.3.8. With some themes with overlays and/or specific scaling options (or explicitly configured viewport), you may want to set the following option to disable the keep_aspect option. Does this “default” theme have blinking leds/etc? I’ve installed it, but it’s static here. If not, are there others available elsewhere? I tried to find, but no luck. Hi, no, this theme does not have blinking leds. The author of the theme did not want me to distribute a version of the theme with blinking leds. You should be able to create a custom theme with overlay images for floppy leds using the information here: http://fs-uae.net/theme-options. i like the theme from ambermoon, but it seems to be incomplete. are the images for inserted disk and led missing? or is it just the background?